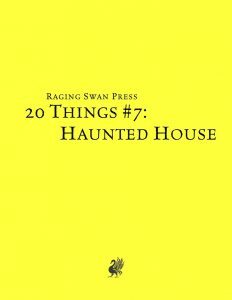 We begin with two types of haunted houses and themes – one of the collections of dressing focus on 10 things you’d find in a burned-out house, and the second 10 things would pertain plague houses – both of these entries are very flavorful and complement the pdf very well: Soot-wrapped bones or bloody, cloth-sacked packages certainly put a chill on my spine. Don’t want to run with one of these general themes? You’re in luck, for 40 entries (20 regular, 20 more entries), from oddly shaped black mold to rotten floorboards complement the pdf and 10 perils help the enterprising GM generate some nice obstacles/mechanically-relevant challenges…in spite of the system-neutral nature of this pdf. 10 nasty rumors about the house help provide a significant sense of foreboding doom. It should be noted, though, that some entries here may be familiar for veterans of Raging Swan Press supplements, namely those of us who are familiar with Alternate Dungeons: Haunted House‘s dressing table. A sampling of 20 evocative treasures and 10 objects to be found within the confines of a rat’s nest do provide a fine array of rewards…but none are easily gained: “20 Unfortunate Discoveries” do not have their name for nothing! Bloody scribblings that note “One of you has been taken.”, an inability to remember the name of deities, bloodshot eyes watching from the cracks f the walls…these are amazing. Finally, 10 intriguing things to be found within spider’s webs provide a nice finish for the so far best installment in the series. Alexander Augunas, Creighton Broadhurst and Cole Kronewitter’s take on the 7th 20-things supplement contains significantly less retreading of previously published material; beyond that, the quality and redistribution of the material is awesome. There is a lot of evocative, thematically concise dressing to be found for the fair asking price. 5 stars + seal of approval. You can get this awesome dressing-file here on OBS!